I was having brunch with some wonderful friends this morning and we talked about childhood a little, and about the ‘soups’ we grew up with. At that moment I remembered my home-made chicken broth that was waiting in my refrigerator for me to finish it off with either noddles or ‘galuste de gris’, which are Romanian style dumplings made out of eggs and grits. Well, nostalgia swept over me since this type of soup always reminds me of mama’s or bunica’s soup, which is basically the way my grandma made when I was little and the way my mom still makes it today. Really easy, whisk together 2 eggs with your fork with one teaspoon of oil and a pinch of salt. Put in about 8-10 tablespoons of grits, little at a time and continue whisking. As soon as the mixture is somewhat solid, where when you put in the fork it is not runny any more, the mixture is ready. Bring soup back to a soft boil and use a regular tablespoon to place ball size dumplings into the soup (Tip: dip in your Tbsp in the soup before you dig into the mixture, that way it does not stick to it while dropping it into the soup). Repeat, you will have approximately 12 medium size (Tbsp size) dumplings. Soft boil for about 10min, uncovered. Turn dumplings over softly with your spoon. Cover, turn off range and let dumplings continue cooking for another 5-10min. 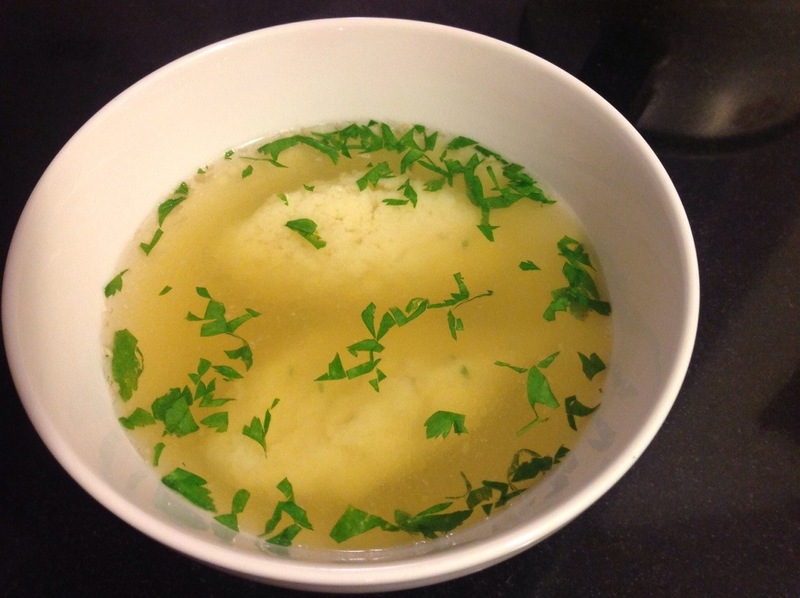 Put soup with dumplings into serving bowl and garnish with fresh Italian/Romanian style flat parsley.